Due to tooth decay, injury or certain diseases many people suffer from tooth loss. Dental implants help deal with this loss by providing permanent or removable replacements. These implants are basically replacement tooth roots which provide the perfect, strong foundation for replacement teeth that take the place of the missing ones to give you a natural look. A surgical procedure where metal frames are positioned into your jawbone after which replacement teeth are mounted on top of them. Since they are fused into the bone, they are stable and provide the right support for the new teeth which prevents slipping or shifting inside the mouth. Dentures are replacements for missing teeth that can be taken out and put back in the mouth. They are also called as false teeth made of acrylic (plastic), nylon or metal. They fit snugly over the gums to replace missing teeth and eliminate potential problems caused by gaps. The process of denture development takes a few weeks and several appointments. Make a series of impressions of your jaw and take measurements. 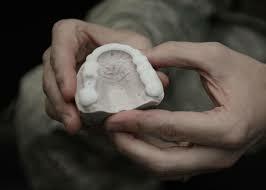 Create models, wax forms, and plastic patterns in the exact shape and position of the denture to be made.